Clashes between police and a group of masked protesters left several injured in Athens, as tens of thousands demonstrated against a name change deal with neighbouring Macedonia. The Greek parliament is due to ratify the deal in days. The violence flared as Greek Prime Minister Alexis Tsipras attempts to face down a political storm over his championing of a landmark agreement with Macedonia, aimed at ending a 27-year dispute with Athens over the country's name. Police estimates put the number of demonstrators at 60,000 at around lunchtime, while organisers said 100,000 people had arrived for the rally, with hundreds of buses bringing demonstrators, especially from the region of northern Greece that also claims the Macedonia name. Ten police officers were hurt in the protests, according to the Greek citizens' protection ministry, while a first aid station said two protesters were hospitalised with breathing difficulties. According to the government "the incidents were provoked by extremists, members of the Golden Dawn (political party), who attempted to enter parliament". "They attacked police with bits of wood and clubs, sending dozens of wounded to the hospital," said a statement from Tsipras. Read more: Why is Macedonia voting on changing its name? Flag-waving demonstrators created a sea of blue and white on Syntagma Square near the parliament, while much of the city centre was closed to traffic and some metro stations shut as a precaution. "There is only one Macedonia, the Greek Macedonia," read a sign in Greek and English held by Christina Gerodimoun, in her 30s, at the protests. "This government is a government of traitors," she said in reference to a coalition led by Mr Tsipras, who brokered the deal with Macedonian counterpart Zoran Zaev in June. Macedonia's parliament approved a constitutional revision to change the country's name ten days ago. But for the deal between the two leaders to go through, the change must also be approved by Greek politicians. Mr Tsipras termed the agreement a "historic step" towards normalising relations between the two countries. He urged "progressive forces" to support the name change, in an interview with Afghi, a daily published by his Syriza party. Mr Tsipras' ruling coalition fell apart over the deal a week ago, but he then narrowly won a vote of confidence, setting the stage for parliament to vote on its ratification. Although political parties did not officially join the demonstration, some deputies turned up to express their individual positions, and Golden Dawn's website urged members to attend. "I came out of patriotic duty," conservative representative Fotini Arabatzi from the northern district of Serres told Skai radio. 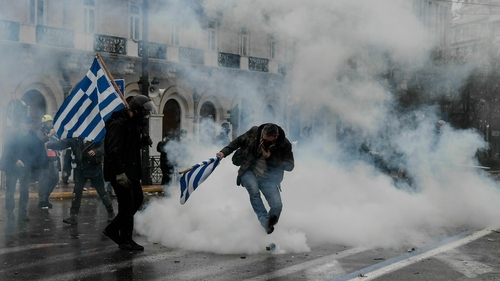 Former Greek premier Antonis Samaras said the protest was "a demonstration for democracy, for Greece and for our rights".